To be perfectly honest, I skipped this one due to the special ESPN 30 For 30 on the final days of Bob Knight at Indiana. It had gotten good reviews and I wanted to see it. So, rather than watch a very predictable loss on the road, I made the right choice. The Rangers were awful in Ottawa. They sadly were shutout by struggling veteran Craig Anderson (27 saves) in a 3-0 loss to the Senators. I knew going in what to expect. You don’t dress a defenseman like Brendan Smith as a forward due to being short a man. It makes no sense. I don’t know why coach David Quinn didn’t just do what I suggested. Work the extra D into the rotation and just double shift a good player when Steven Fogarty and Tim Gettinger get on the ice. I also never understood why Quinn broke up his best line. 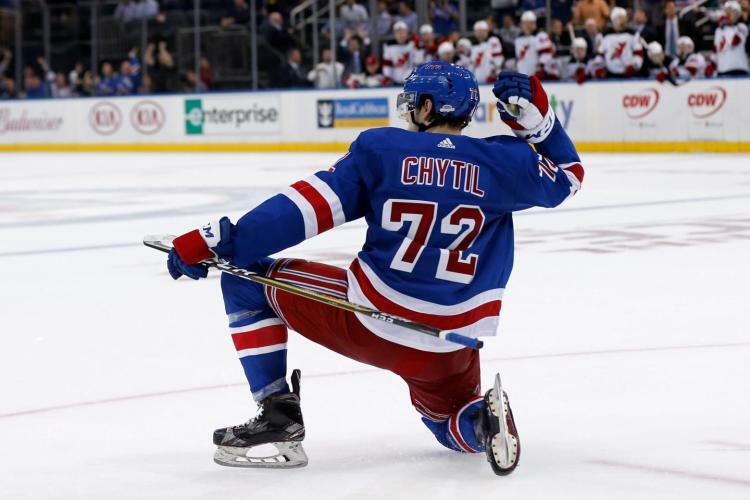 Kevin Hayes, Chris Kreider and Filip Chytil have been rolling. Even when they aren’t scoring, the cohesive trio generate quality chances. You don’t change the one line that’s been going. Even if Mika Zibanejad doesn’t have ideal linemates, he’s proven that he can go against the top scoring lines head to head. Why not bump Jimmy Vesey to that line and keep Jesper Fast on it? Both he and Zibanejad just had good games on Monday. For Fast, it was two straight games with an assist. It’s ironic that he got screwed out of a goal due to a quick whistle. Instead, Quinn made a rookie mistake with the lineup by trying to use Smith for two periods on a perplexing fourth line. He slid Fast down to the third line with cooling rookie Brett Howden and bumped Lias Andersson up. Vesey moved onto the Hayes line with Chytil while Kreider and Ryan Strome played with Zibanejad. It backfired. That line was awful. They were victimized by the Sens on two goals. Strome forgot to take the man in front on the first goal, and a lazy Zibanejad turnover led directly to Magnus Paajarvi going high blocker on Henrik Lundqvist for a 2-0 lead. Of course, I caught that part during a commercial break. Ugh. I didn’t turn the game back on. I knew it was over. Even from the little I caught, I could tell they were getting outskated and out worked. Right as I said that came the Zibanejad failure to clear the zone followed by Paajarvi’s goal. Marc Staal couldn’t take the pass away getting caught leaning. Lundqvist should’ve had the shot. It was bad all around. As for Matt Duchene scoring a gimme on a great sequence in the third for the third Ottawa goal, it was awful by the Rangers. They looked dizzy getting turned around with Tony DeAngelo nowhere near Duchene. It was a tough night for him. He was on for all three Senators goals. The funny thing is Quinn didn’t staple him to the bench. That dubious honor went to Kevin Shattenkirk, who never took a shift in the third period. Why him? Quinn said that will remain between them twice in the post game. Oh boy. I have no idea why. Maybe he just felt like letting Smith take regular minutes in the D rotation. Fredrik Claesson played regularly in his return to Ottawa. From looking at the score sheet, it looked like he had a active game. But when Staal is tied for the team lead with three shots, it doesn’t say much for the offense. The Rangers may have been credited with 27 shots on goal. But it sounds like it was an easy shutout for Anderson, who still has a GAA around 3.50 while raising his save percentage to .902. Quinn didn’t sound too impressed with his team. Neither did Staal or Lundqvist, who emphasized doing the little things better away from MSG. They have a road problem. The loss was their second straight on the road by a shutout. Calvin Pickard did it to them last Friday. You know. The former Flyer who was claimed on waivers by the desperate Coyotes due to another one of my awful goalies getting hurt. I’m referring to Antti Raanta. Between him and Roberto Luongo, I think I should make goaltending optional. The Rangers are a abysmal 3-7-2 on the road. They stink away from MSG. Of course, that means they’re much more successful at home boasting a 10-4-0 mark. Not too surprising considering the youth. It’s good that they win at home. But they must learn how to win on the road. Next up is the House of Horrors. Montreal on Saturday. Sunday is the special home game honoring Vic Hadfield. The original Number 11 goes up to the rafters in a special ceremony, joining GAG (Goal A Game) linemates Rod Gilbert and Jean Ratelle. Doors open at 4:30. The game starts after 6 against Winnipeg. This entry was posted in NYRangers and tagged Brendan Smith, Craig Anderson, David Quinn, Fredrik Claesson, GAG Line, Henrik Lundqvist, Jean Ratelle, Kevin Shattenkirk, Magnus Paajarvi, Marc Staal, Matt Duchene, Mika Zibanejad, Rangers, Rod Gilbert, Ryan Strome, Senators, Tony DeAngelo, Vic Hadfield. Bookmark the permalink.